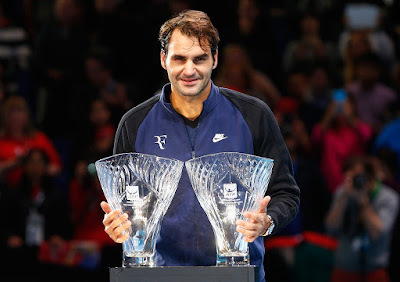 Roger Federer was honoured in a special ceremony on opening night at the ATP World Tour Finals, receiving his two trophies in the 2015 ATP World Tour Awards. "I enjoy getting awards, especially the ones voted on by the fans and my fellow players," said Federer. "It's a very nice moment once again in my career. I try to do it with style and of course I play hard with everything. You guys give it the respect and it's very nice. Many other players deserve the awards as well and I'm very much aware that there are many other good guys out there. That's why I'm still playing the game. "I'd like to thank the fans for voting and cheering for me, and coming out not just for my matches. Keep doing that in the future. This is one of the greatest tournaments we have on tour and I hope you enjoy today's matches and I see you next year and following year and the following year and many more years." Following his straight-set win over World No. 6 Tomas Berdych, Federer’s coach and childhood idol Stefan Edberg stepped onto the court at The O2 to present the Swiss with the trophy named in his honour, the Stefan Edberg Sportsmanship Award. Federer had been voted by fellow players as the winner for an 11th season, and received the trophy from Edberg himself for the second year in a row. Rafael Nadal, David Ferrer and Kevin Anderson were also nominated in this category. Chris Kermode, ATP Executive Chairman and President then presented Federer with the trophy as ATPWorldTour.com Fans’ Favourite. He received 65 per cent of all votes cast online by fans, extending his record winning streak to a 13th straight year. Rafael Nadal finished in second, followed by Novak Djokovic, Andy Murray and Kei Nishikori. Since 2003, Federer has won a record 31 ATP World Tour Awards.